To reduce the threat that ghost fishing gear represent for vaquita, Pesca ABC participate in an Initiative to remove as much ghost nets as possible. Since October 2016 to date (November 2017), in 4.8 months of effective work 462 nets have been effectible extracted meaning an average of 40.7 tons of weight. 85% of the derelict gear extracted was for totoaba fishing (gillnets and longlines). 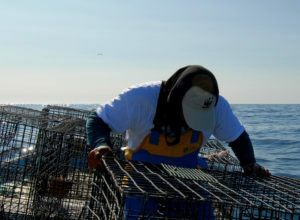 Now, retrieved nets are safely packed in 163 silo bags and put in containers. Soon will be recycled into ecofriendly products. This effort is leaded by SEMARNAT and integrated by Pesca ABC; INECC; Navy; PROFEPA; CONANP; Sea Shepherd; WWF-Mexico; CONAPESCA; the Whale and Marine Science Museum; SEDENA; World Animal Protection; and Parley for the Oceans. The project is funded by Marisla Foundation and aims to turn Pesca ABC into an operative NGO, that contributes to the preservation of the environment through the promotion of the sustainable use of its natural resources. DAN, a non-profit organization, which main objective is to promote the effective application and execution of the law in order to guarantee the conservation of biodiversity in northwestern Mexico, collaborate with us. October 3 & 4, 2017, Pesca ABC participated in the First Strategic Planning Workshop of the Committee for Economic and Community Development of the Upper Gulf of California resultant of the agreement signed in summer of 2017 by Carlos Slim Foundation, DiCaprio foundation and Mexican President Enrique Peña Nieto to save the vaquita. The purpose of this workshop was to develop objectives and a work plan that will cover the 2017 and 2018 fishing season, with an eye towards having strategies that can extend to longer term. Even though we have suggested that this is a plan for the Upper Gulf, the focus was principally for the communities of Golfo de Santa Clara and San Felipe. The work focused on five strategic areas: responsible/sustainable fishing, economic alternatives, social development, environmental education, and social communication. Storied Seafood was developed by the nonprofit Aquarium of the Pacific’s Seafood for the Future program in collaboration with NOAA Fisheries Southwest Fisheries Science Center. A group of forward-thinking fishermen are leading the way in their community and providing an example for the rest of the world. Their stories give great hope that it may be truly possible to switch from gillnets to alternative fishing gears that do not endanger vaquitas and that support new and sustainable livelihoods. More available here. Between Sept, 11-15th 2017, based on the advice from the Expert Committee of Fishing Technologies (ECOFT) on actions towards alternative fishing technology for catching finfish Swedish University of Agriculture Science (SLU) and Technical University of Denmark (DTU Aqua) hosted a workshop in Sweden for Mexican gear manufactures and fishers with specific focus on pots, traps and small seines. The main idea was to get the Mexican delegation familiar with the new gear types both with respect to construction and handling. Design and develop new fishing gear. Research and test with alternative fishing gear to gillnets. Provide fisher to fisher training. Promote the exchange of knowledge and experiences with other fishing communities. Provide support in the development and maintenance of fishing gear. Foster a sustainable consumption culture of fishing resources and promote new markets of value. 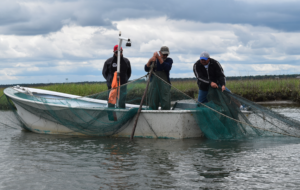 Participated in experiments with alternative fishing gear including rigid and collapsible fish pods, stow nets, as well as adjustments to the regulated ecological small trawl for shrimp. Experimented with the use of the RS.INP.MX (acronym in Spanish for Selective Net of the National Institute of Fisheries of Mexico) selective fishing gear, showing that it is effective for catching shrimp and does not affect the vaquita. Trained local fishermen in the design, manufacture and maintenance of alternative fishing gear; and trained 102 fishers in the Upper Gulf for the manufacture of an ecological small trawl for shrimp. Contributed in repairing and restoring 47 small trawls for shrimp and 30 Turtle Excluding Devices (TEDs). Participated in the first exchange of knowledge for the use of the small trawl for shrimp with fishers from El Golfo de Santa Clara, in Sonora; and San Felipe, in Baja California. Participated in finfish and shrimp monitoring activities. Received training from NOAA in the United States, to improve the use of various fishing systems. Featured fishing products at tasting dinners, in order to promote the consumption of “vaquita-friendly products”. 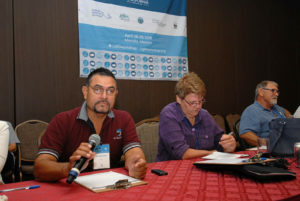 Participated at the Fishing Technologies for the Upper Gulf of California 2016 Workshop held in Merida, Mexico, where experts from around the world in fishing technologies gathered to discuss alternative fishing gear that could allow fishers from the Upper Gulf of California continue with their way of life without affecting the vaquita. Contributed with promotional campaigns and the media to document sustainable fishing activities in San Felipe. Received the Merit for Conservation Award in the winter of 2015 by the Society of Marine Mammalogy. Represent the sustainable fisheries sector in order to participate in decision-making processes that affect sustainable fishing in the Upper Gulf of California and contribute to the conservation of natural resources. Research, develop, train and promote the use of fishing gear that does not harm the vaquita. Collaborate with authorities and strategic partners in the research and development of alternative fishing gear. Provide and organize training courses on the development, maintenance and use of sustainable fishing gear. Promote education among consumers towards fishing products caught with sustainable fishing gear, as well as the benefits that it brings to the region and to fishers. Organize awareness campaigns oriented towards sustainable seafood consumption and encourage respect and the importance of natural resources.